Microsoft is giving away hundreds of free ebooks currently covering a wide variety of topics that include Windows, Azure, Office, Windows Server, and SharePoint among others. What's particularly interesting about the giveaway is that it features recent publications as well as older ones. The Windows category for instance lists 14 ebooks covering Windows 10, among them "Introducing Windows 10 for IT Professionals", "Deploying Windows 10: Automating deployment by using System Center Configuration Manager" and "Upgrading to Windows 10: A simple hands-on guide for everyone". Not all publications offered for free are full-blown ebooks with hundreds of pages though. Many are, but there is also a good selection of shorter publications, for instance the one-page PDF file that compares security features of Windows 7 with those of Windows 10. Most ebooks are designed for IT professionals, administrators and business/Enterprise use. While that is the case, some are without doubt useful for home users as well. Many ebooks are offered in several formats, with PDF, EPUB and DOCX the most common formats. You will find the occasional MOBI format thrown in but that is about it. All ebooks are completely free which means that they don't have an expiration date associated with them. One issue that you may run into however is that there is no "download all" button available that works. While there is a download all button displayed, it lists to a FAQ page that reveals why there is no such download option. The following list provides you with a sample listing. 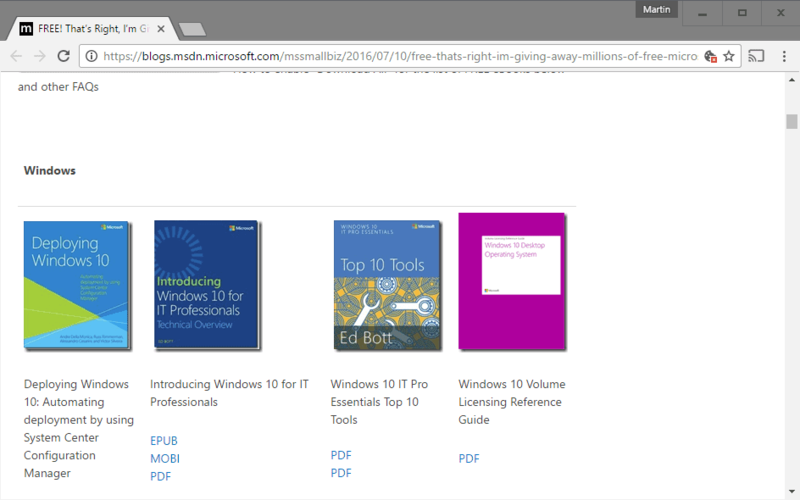 All ebooks listed below are offered as downloads on the MSDN website. The selection includes quite a few quick reference sheets for various Microsoft products. It is unclear for how long these ebooks will be offered for download, so grab them as quickly as you can before they are pulled again. Now You: Found an interesting ebook listed on the page? Let me know in the comments. The post Microsoft gives away lots of free eBooks appeared first on gHacks Technology News.